GASES can be modelled as small particles (representing the molecules or atoms of the gas in question) flying about in all directions. (This simplified model is called an ideal gas.) As these particles strike the walls of their container so they exert a force on the container pushing it outwards. This force per area is the pressure exerted by the gas. This animation shows gas particles being introduced into a cubic container to illustrate the concept. If the dimensions of the cube are unity then the force on a wall represents the pressure of the gas. PRESSURE VOLUME RELATIONSHIP: when the volume of a gas increases then the particles are more spread out. A given area of the container therefore experiences fewer collisions and thus less force. Effectively, the pressure drops as the volume increases. This is enshrined in Boyle's Law which states that the gas volume is inversely proportional to the pressure at a given temperature (see an animation of pressure increase with temperature increase). 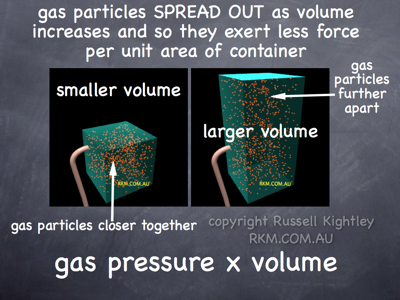 In this animation it is the container that enlarges, not the gas forcing the expansion. BUY THIS ANIMATION of gas volume & pressure (Boyle's Law)!